This easy enchilada recipe is so filling & delicious! Whole wheat flour tortillas filled with ground turkey, black beans and spices, then smothered with a homemade enchilada sauce. 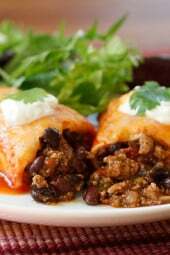 For the enchilada lover out there, these enchiladas are great tasting, high in fiber and very filling! One filled me up with a salad, my husband with a bigger appetite filled up on two. Top them with a little fat free sour cream, scallions or cilantro on top. Look for half point tortillas that are whole wheat and low carb such as Tumaro’s, La Tortilla Factory or Trader Joe’s. If you like this recipe you may also want to try one of my favorites, Chicken Enchiladas. In a medium saucepan, spray cooking spray and sauté garlic. Add chiles, chili powder, cumin, chicken broth, tomato sauce, salt and pepper. In a large skillet brown the turkey and season with salt. When the turkey is browned, add onion, garlic, black beans, cilantro, green chiles, diced tomatoes, cumin and chili powder. Mix well and simmer on low, covered for 20 minutes. Remove lid and simmer an additional 5-10 minutes to reduce the liquid. Spray a 13 by 9-inch glass baking dish with non-stick spray. Put 1/2 cup turkey mixture into each tortilla and roll it. Place on baking dish seam side down. I justmade this and it was delicious! I love this recipe! I have made this many times! I have made this recipe at least 5 times with no additions/edits and it always turns out amazing! Like previous comments have mentioned, blending the adobe chiles and freezing the leftovers has been really helpful at reducing waste. The first thing my boyfriend said when he tasted these was that the enchiladas taste like they’re from a restaurant! I attribute that to the incredible sauce. I am going to make these for a dinner party tomorrow and am going to try using shredded chicken this time. Of all your enchilada recipes (and yes, I’ve e made them all) this is my 18 yr old son’s favorite. He asks me to make extra sauce which he uses to dip nacho chips in instead of salsa (he doesn’t like chunky tomatos). Another winner! I found some low carb high fiber tortillas and the family loved it! One thing great about all of these recipes is that you can adjust ingredients or add whatever is in the fridge. I was glad I tasted the can of the chipolatas in adobe sauce, a little hot for me but I adjusted the amount and turned out great. Would you say the turkey filling freezes well? I couldn’t find canned green chilli where I am (Australia). I added a chopped green chilli (without seeds) and then 1/2 cup of chicken stock to make up for the fact that there was no liquid with the chili. It’s in its final 5 mins of cooking and I can’t stop taste-testing… so I’ll say it worked!!!! This recipe is awesome! I made it tonight and my husbands only comment was that I didn’t make enough (Even though I made 5, which was definitely more than enough lol) so delicious. I used “let’s skip the sandwich” multi grain wraps and it was perfect. I’m not one to leave comments but had to for this one. Thank you! Made this tonight and they are outstanding!! The homemade enchilada sauce is delicious and so easy, I’ll never buy canned again. The stuffing is super yummy and the combo with the sauce is the perfect blend of flavors. Also one enchilada with a side salad was very filling. Definitely going on our dinner rotation. Thanks for an awesome recipe, 5++ stars! I just made this for my family last night. It was delicious! Due to time constraints, I took the filling and made quesadillas using the enchilada sauce as a dipping sauce. This was so yummy and making quesadillas instead of baking enchiladas cut down the cooking time! We will definitely make these again. My six year old LOVED these. Thanks Gina, we love your recipes! I am making these again but last time I made Mexican Rice and beans and want to find better and healthier side options. Any suggestions? I love your recipes and so does my family! You are my go to for healthy tasty food! I like just some simple roasted broccoli florets or steamed/sauteed with garlic. We had these again tonight. So yummy!! 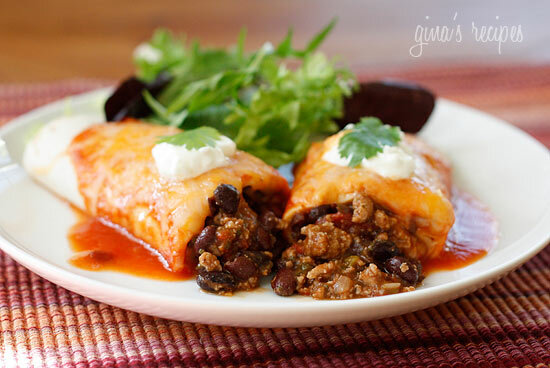 Gina – I keep coming back to your recipes again and again, these enchiladas were delicious. And I cheated and use canned enchilada sauce. Please keep up the good work. Made this for dinner and it was the best enchiladas I have ever had! Mexican rice as a side. The wife also thought they were excellent. Gina, I am afraid my wife may start to get jealous as I am always saying "it is a Skinnytaste recipe"! Thanks. Loved this recipe! Plenty of leftovers too. Gina, you always offer the opportunity to make homemade enchilada sauce, but this was my first time doing it. It was so much better than the canned stuff that I'm sorry I haven't done it every time. Love the enchiladas! These are great! Made them tonight and they were delicious. Looking forward to leftovers. I made these last night and my husband actually stopped eating and kissed me. I forgot the green chilies and made my own chipotle in adobo…but other than that…wow. Excellent recipe, thank you! This recipe was absolutely amazing. As a Triathlete trying to lose weight while training, this had a beautiful combination of fats, carbs, protein, fiber…and of course YUM!!! Thank you so much!! My new favorite!! This is out of this world!!!! Love it!! Delicious!!! 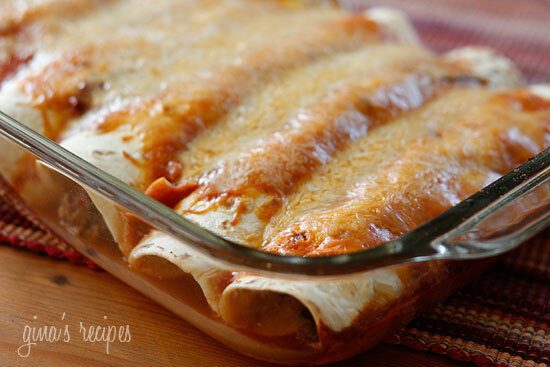 Our new favorite enchilada recipe:) love the homemade sauce as well! 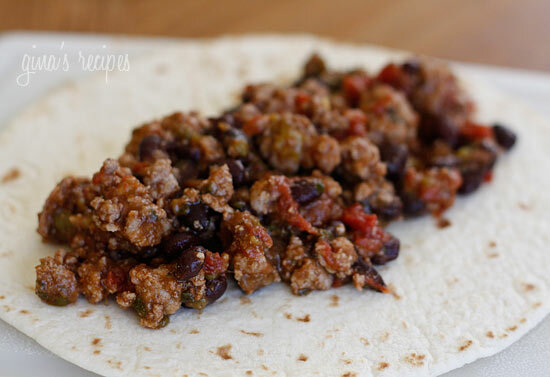 I was looking for a recipe using ground turkey, and came across this one. I made it for dinner tonight, and everyone said to "Save the recipe!". I will be returning to this site often. Thank you! I added a few diced zucchini too and if I make them again, I'll add a bit of frozen corn. They were so good!! I like the suggestion someone made about draining the tomatoes. I'd do that next time too. I love this site. I'm making the majority of my meals from it the last few weeks. Cooking in my crockpot and smelling good! I layered rather than rolled, 1/3 sauce on bottom, corn tortillas, 1/2 meat/bean mixture, 1/3 cheese, 1/3 sauce, corn tortillas, 1/3 cheese, remainder of meat mixture, top with sauce and remaining cheese. I am cooking on high for 2 – 4 hours (will keep an eye on them since I am experimenting) Can't wait to try! Thank you Gina for such tasty ways to eat healthy! Hi – I am hoping to freeze these to have at a later date. How would you recommend freezing them? I had never made enchilidas before now. I am pregnant and saw this recipe and HAD to have them so I bought the ingredients the same day and made them for dinner. Not only were they easy, they were AWESOME! I didn't change a thing except I used corn tortillas instead of flour (just my preference) and my husband took one bite and said they were better than the ones you get from the restaurant. Even better the next day! Thank you for the great recipes Gina! My boyfriend and I LOVE these!!! I use super lean ground beef instead since he is not a fan of ground turkey. I also make his in tortillas but I put mine in a hollowed out zucchini boat for a lower carb option…so yummy!!!! Again – another fantastic and flavorful recipe! I used 1T of the chipotles and was a little concerned that the sauce was too hot when I tried it separately – but on the enchiladas it was perfect. Great flavor all around – definitely did not taste like a low-fat dinner! I just made these, and they were very good! To save time, I think that you could make the sauce while the turkey started simmering. Thanks much! I am still hoping I can make them tasty however the directions are a mess. The first piece is for the enchilada sauce, no mention of the garlic in those directions and those are chipotle chiles not green chiles. Love the site though. I agree..I messed up due to poor directions. These enchiladas were amazing!! By far my husbands favorite enchiladas from your collection since they aren't as spicy and he loved the red sauce. I followed the directions exactly but it made enough filling for an extra 4 enchiladas, so I made 12 enchiladas instead of 8. That's ok since we will enjoy them for leftovers without hesitation! But maybe instead of using the 6 inch tortillas next time I will use the burrito size instead so we don't have as many. We enjoyed these with your Cilantro Lime Rice and some homemade salsa. Delicious!!! a tip I learned from Rachael Ray about the chipotle in adobo. (her tip was to processor and put in a ziploc and break a piece when needed) I dump the whole can in a mini food processor and pulse it down to a paste. then take a cookie sheet lined with foil and drop tablespoon of the paste. pop in freezer to harden up. then I wrap each tbs worth in saran wrap just so it is easier to pull out the amount I need when needed. Before I learned this tip I can't tell you how many half used cans I threw away. I transferred mine from the can to a jar (an old jar I had from some pickles, which I washed) – they’ve remained in the fridge totally fine for about 3 months. Since then I’ve made about 4 batches of enchilada sauce plus some other recipes that call for the chiles, and the can/jar is almost finished. Yum! Just made this great meal today for my family. Always looking for great low fat receipes to make. My husband and I started weight watchers one the 1st. This was like eating resturant food.. I will make again… I bought the chipotle chiles in adobe sauce in a can. It was in the ile where you would find taco stuff. It is a chiile pepper soaking in read adobo sauce. buy the small can you do not need much and you will need to dice the peppers when you pull them out of the can.. I cannot click on the link for the adobo sauce. Can anyone share what this is?